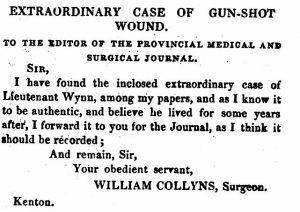 Today’s medical journals pride themselves on their topicality, publishing the latest research as soon as it’s available – but those news values did not apply in 1845, when the Provincial Medical and Surgical Journal agreed to publish a case report almost half a century old. It was sent to them by a retired surgeon, William Collyns, who had apparently found it down the back of his sofa. W. WYNN, Captain Lieutenant 23d Regiment. I do hereby certify, that I first visited Lieutenant Wynn on the 2nd December who was considered as a dying man by all the physicians and surgeons of this place who had seen him, and it was only in consequence of his being in the 17th Regiment, many of the officers of which I had known very intimately, while in St Domingo, that I was induced to visit him, rather from motives of politeness than the hope of being serviceable to him. I found him in the most deplorable state of debility and emaciation, coughing up at least a pint of purulent matter daily from his lungs, attended by violent hectic fever and other symptoms which but too clearly denoted his approaching dissolution. All these symptoms appeared evidently to me to be the consequence of a wound in his side, received, as he informed me, on the 2nd of October in Holland. The wound in his side had been caused by grapeshot, a particularly nasty type of anti-personnel ordinance consisting of medium-sized lead balls. After examining the wound, which externally was now nearly healed up, I judged it proper to lay it open, thus endeavouring to trace the progress of the ball, but without effect. A few days after I made another incision into his side, but I was still unsuccessful in my attempts to detect the cause of so much mischief. On the 11th, however, the matter which passing through his lungs, had ceased to flow out at the external wound, now made its appearance there, and a probe being introduced at the orifice from whence it flowed, a ball was discovered at a depth of several inches. This all took place in 1799, half a century before the advent of anaesthetic agents; so what followed must have been quite a trial for the young officer. On the 12th I proceeded to extract the ball. After making a large and deep incision into the cavity of the chest, I found the ball much too large to pass between the interstices of the ribs. Two of the ribs had evidently been fractured by the ball in its passage into the lungs, but were now healed. Besides it is easy to imagine that what the force of gunpowder will put in what mere manual force cannot take out. I was thus under the necessity of sawing away a large portion of the rib, to make room for the passage of the ball, which, being composed of iron, rendered the operation much more tedious from its very frequently eluding the grasp of the extracting instrument. The lieutenant thus had to endure a surgeon making a large incision through skin and muscle, sawing through an entire rib and then inserting a large pair of forceps to grab on to a projectile buried several inches into the chest. 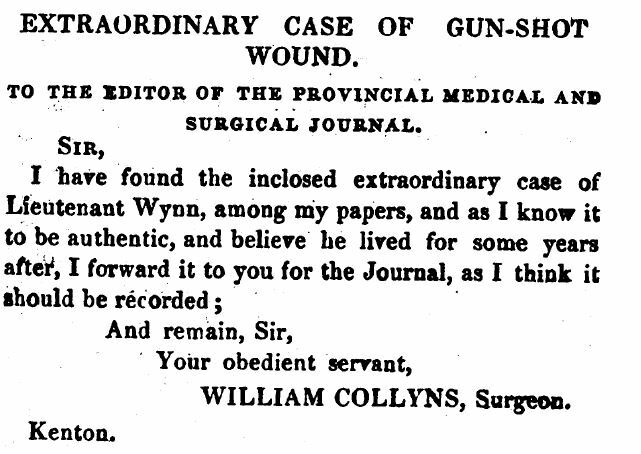 After much practice, during the present war, in gunshot wounds, I am without hesitation in pronouncing Mr Wynn’s case to be the most important I have ever had under my care and the operation to be one of the most difficult I ever performed; which, but for the unshaken fortitude of the unfortunate sufferer, could not have been effected. Those who know the high importance of the lungs to animal life, and are capable of appreciating the great injury they must have sustained by the lodging of so large a substance, so deeply seated, and for such a length of time, will be more capable of conceiving, than I of describing, the acute sufferings, both of the mind and body, which Mr Wynn has of necessity undergone. It doesn’t take a great deal of imagination to appreciate what he must have gone through. As Mr Wynn has frequently asked me my real opinion of his actual situation, and as he has appeared to me to possess a firm mind capable of hearing truth, I have not attempted to conceal from him that, though he is now much better, and I fervently hope, likely to recover, yet he is still, and must for a considerable time be, in a dangerous and precarious state. T. HUNTER, M.D., Surgeon to the Forces. Appended to this report is a short note which gives further evidence (if any were needed) that this was far from a trivial case. The grape shot extracted from Lieutenant Wynn’s lungs weighs three ounces and a half and three grains. It was weighed in the presence of Lieutenant Colonel Locke, of the 5th West York. Thank God for modern medicine. Captain Lieutenant Wynn obviously had the fortitude of a Viking! And how amazing is the human body in its mysterious ability to heal from such a traumatic wound?? ?